I’m generally a crammer, even when I was still a student, so right now, I’m pretty nervous whether I will get my shopping done before Christmas. The godchildren, thankfully, I have shopped for last November. Ipe was on a business trip and I needed a break after one week of hospital living (when Joey was hospitalized for diarrhea) so I did early shopping. Last Monday, I was on sick leave, but since Market Market was only five minutes away, I took the cab and did shopping at 12 noon. Hahaha. Now I still need to shop for Joey’s gift. And for one of my sisters in law ( I have four since Ipe is an only son). I’m planning on getting him the toy car – you know, the remote controlled car that he can drive himself. I’m being a bit generous this year since I was away most of the time (suhol to). Though I need to check the battery consumption –> if it’s too much I’ll just get him some other toy. Hahaha. But I did enjoy lunch at Mom and Tina’s. I haven’t been there in over six months, I think. 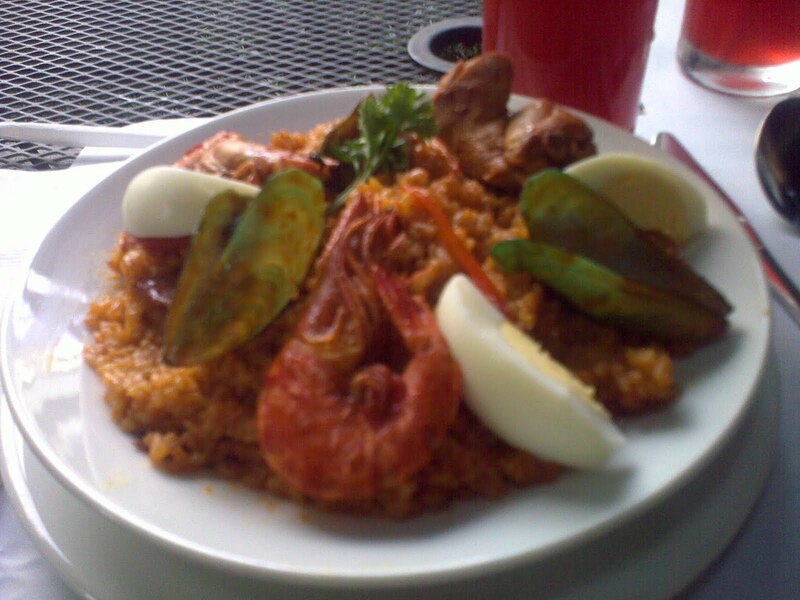 I got the red iced tea and paella valenciana.